Who LOVES Jamie Rae Hats? WOW! We made the preliminary nominee list for “Best Accessories” Earnie Award 2015, hosted by Earnshaw’s Magazine! All of us here at Jamie Rae Hats have always considered our hats the BEST in the biz…of course we might be just a tiny bit biased. We were SO EXCITED to be considered for this! It is an honor to be listed among the other beautiful brands. I would appreciate your vote very much to secure an Earnie Nomination !! As always, I appreciate your support!! Happy, humbled and honored to announce that Jamie Rae Hats Inc. was voted #1 in the Hat/Headwear category in the “Reader’s Favorite” issue of Baby & Children’s Product News magazine! It’s quite an honor and we are so grateful for our customers who voted! Thank you! Buzz Buzz & Woot Woot! As the new year begins…the bee in my bonnet has started to buzz even louder. I almost had to pinch myself…as this month marks ten years in business for Jamie Rae Hats! I feel so lucky to wake up each day to the MOST adorable images of babies wearing their Jamie Rae Hats. 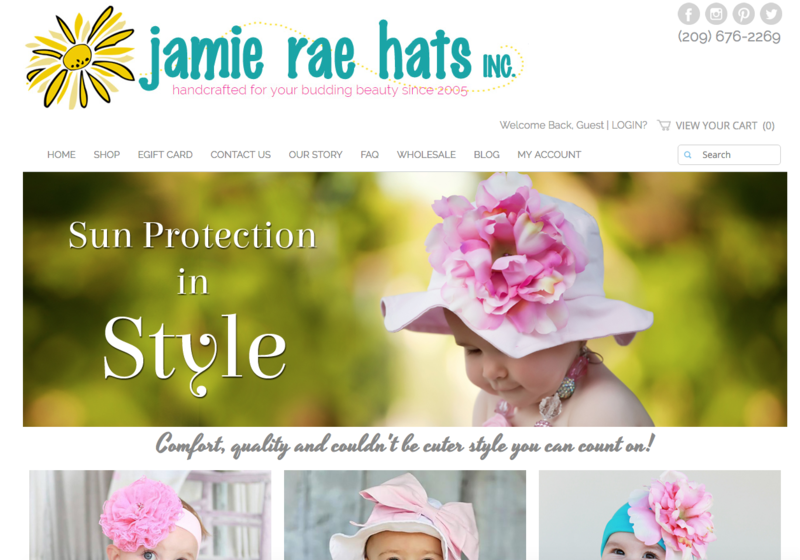 Over the last ten years Jamie Rae Hats has become a favorite among moms and babies across the globe. I am always elated when I get an email or FB comment from a customer complimenting our brand. When I pick up the phone at work…customers will sometimes say…”Is this Jamie Rae..as in the Jamie Rae?” It makes me blush and laugh…..but I have to admit, makes me feel extremely proud! I have a team that works hard every day to put out the best possible product and customer service that they can. I have customers that spread the word and are so loyal. I have a family that supports me and the time it takes to maintain a growing company. I have plans to introduce a new product this year and would will continue to connect with parents all over the country. We will continue our kindness movement as well! Our customers offer us invaluable information and we truly appreciate it! I pride myself on being an ENTREPRENEUR! The road has been long, hard, educational & fun! The biggest thing I have learned is that 10 years did not come without a LOT of determination, self-discipline and effort. To all of those who have an idea…go for it! Invest in yourself and you can receive the biggest reward. For me it is pride & a flexible schedule, that allows me to experience my kids and everything they are involved in. With her garden organically grown! Seven years ago next month I sat down at my ancient computer to build a website for my new company, baby cappelli. Weeks before, I had made our daughter, Emma, a baby hat with a flower on it and the town went wild. After giving several as gifts and selling to our local boutique, I made the decision to purchase 2000 blank hats. I figured if they were selling in my town, the would sell anywhere. So it began………built a website, which I knew nothing about. Registered my business name with the trademark office, which I so carefully picked, baby cappelli (hats in Italian), and placed orders for materials. After sending out a few emails and post cards, it was not long before I had orders rolling in. The first year of the business was hard, as I was working from home with two children at my feet. I worked many late nights and weekends to get it all done. After one year I had built a real business from marketing my flower baby hats! I had enough money to convert the garage to a work shop and hire two employees. In Feb of 2006 I got the letter. It looked very official. It was from a company in New York that claimed the business name I had chose was too similar to their business name. I was worried, but knew that the trademark office would not have approved if that were the case….right? WRONG! Off to NY I went to defend my business only to find that it was not about the paper I had in hand saying my business name had been approved, but more about big business and who had the money to hire the better attorney. Everything that I had sacrificed in the past year, mainly time from my husband and kids to build something that I thought would ultimately give me more time with my family had been taken away. I was physically ill and completely defeated when I returned home. I felt like I was not cut out for this nasty way of doing business. When I pulled in the drive, I was welcomed with a huge WELCOME HOME banner made by the kids and hung across my new converted garage that my husband had finished while I was away. I made the decision right then to keep going. I changed the business name to Jamie Rae Hats, it is my first and middle name and something I figured no one could ever take away from me. I worried about what my customers and boutiques would think and if the brand would survive the name change. Everyone was so kind and supported me through the transition. No one cared about the name, as long as they could get the hats and the service they had come accustom to. Here we are 6 years later still going strong. It is thanks to all our amazing customers, boutiques, reps and employees! I felt compelled to share this, as I received a call from a customer that mentioned she bought an original baby cappelli hat years ago…and it made me smile. Many know the story, but many do not. Over the years we have received calls from other new companies or mompreneurs asking for advice. I have learned many things over the past 7 years, but the one thing that sticks out most and the advice that I share often is; do the right thing and in the end it will all come back to you! Conduct your business in a way the reflects the way you live your life. Creating a business and maintaining it is hard work and does not come with out challenges…mine just happen to come very early on. Thank you all who have supported Jamie Rae Hats over the last 7 years with your kind words and orders! You have inspired me to keep going even through the hard times. We are grateful for where we are in the market place today and feel proud to be considered a leader in the baby hat category! Looking forward to a fun year at Jamie Rae Hats! We have several new products coming out and are excited to share them.